Mitt Romney's Harvard MBA and gold-plated resume convinced many business leaders he would follow in the tradition of corporate-friendly Republicans when he was elected governor of Massachusetts in 2002. Within three years, some had a vastly different opinion, after Romney's efforts raised the tax bill on businesses by $300 million as part of a multifaceted plan to eliminate a state budget deficit estimated from $2.5 billion to $3 billion. Romney, who is now running for president declaring he never raised taxes as governor, says he merely closed "loopholes" in the tax code. Business leaders see things differently. "These certainly were tax increases and a new source of revenue for the commonwealth," said Brian Gilmore, executive vice president of Associated Industries of Massachusetts, the state's largest business lobbying group. "His indicating that he balanced a budget without raising taxes is misleading at best," Gilmore added. "We respectfully disagree." Romney spokesman Eric Fehrnstrom said the loophole closings were more about tax enforcement than tax increases. "In cases where companies were using aggressive accounting to escape their tax liability in a way that was never intended by the law, we closed those loopholes," he said. Nonetheless, Romney's tax loophole fervor was so infectious, it caught the attention of the Legislature's most liberal lawmakers, who ended up offering to help him hunt down more gaps in the tax laws. They pushed Romney to roll back tax breaks approved in the 1990s to benefit defense and mutual fund companies like Raytheon and Fidelity - a suggestion he rejected. "There's going to be a lot of debate over the definition of what is a loophole and what is a break and what is a tax," Romney said during his first year in office. On the stump, Romney boasts that he is the first Republican presidential candidate to sign a no-new tax pledge offered by the conservative Americans for Tax Reform. He did so in January, a day after he concluded his term as governor. While Romney refused to sign a similar pledge in 2002 - Fehrnstrom labeled it "political gimmickry" at the time - today he criticizes GOP rivals like Rudy Giuliani, John McCain and Fred Thompson for not following suit. He has also tried to winnow the GOP primary fight to a contest between him and Giuliani, in part by noting the former New York mayor sued to kill the presidential line-item veto in 1997 and the Supreme Court eventually found it unconstitutional. Romney also lambastes Giuliani for threatening to sue former New York Gov. George Pataki, a fellow Republican, when he challenged a $400 million tax on commuters coming to New York City. The state Legislature repealed it in 1999. Romney, however, speaks much less about his work raising tax revenues from businesses while courting fiscal conservatives and other Republican primary voters. One of the biggest tax "loopholes" identified by Romney were real estate investment trust subsidiaries created by banks to hold mortgages. Parent banks received dividend income from the trusts and took advantage of deductions to lower their state taxes. "The biggest loophole closing involved banks that were calling themselves real estate companies in order to avoid bank taxes," Fehrnstrom said. "Those were the types of abuses we stopped. That's called tax enforcement." Revenue officials said there were between 50 and 60 real estate investment trust subsidiaries in Massachusetts when Romney signed the law in 2003 barring them and retroactively collecting the taxes back to 1999. The banks sued and eventually reached a settlement with the state to pay about half of the retroactive taxes. Businesses were also angry at Romney's incremental approach to tighten those laws. 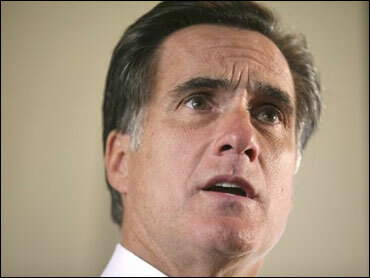 Romney proposed such "loophole" closures over three successive years, but he hit a wall in 2005. Pressure from business leaders forced him to cut in half a proposal for $170 million in tax loophole closures. He also had to abandon a plan to give the state's top revenue officials authority to pursue corporations that lowered their tax bills by transferring profits outside Massachusetts. "The thing that was irritating about it is that he kept coming back the following year. At that point, I was thinking, 'You already had your shot at the apple,"' said Bill Vernon, state director for the National Federation of Independent Business. "When you continue to do that, it has a negative impact on business." Estimates of the total revenue increase generated by the business tax loophole closings range from about $300 million, as calculated by the national anti-tax Club For Growth, to $400 million, as calculated by the Associated Industries of Massachusetts. The efforts to tighten tax laws are part of a larger, more complex history of Romney's tax record. While governor, he succeeded in pushing a one-year rebate of $275 million in retroactive capital gains taxes, as well as tax credits for investment, manufacturing and research and sales tax holidays.